Seasonal Compromises - Family Times is an award-winning magazine with staff-written news, feature stories and artwork that inform and inspire Central New York parents and their children. When thinking about the holidays, most people focus on family. 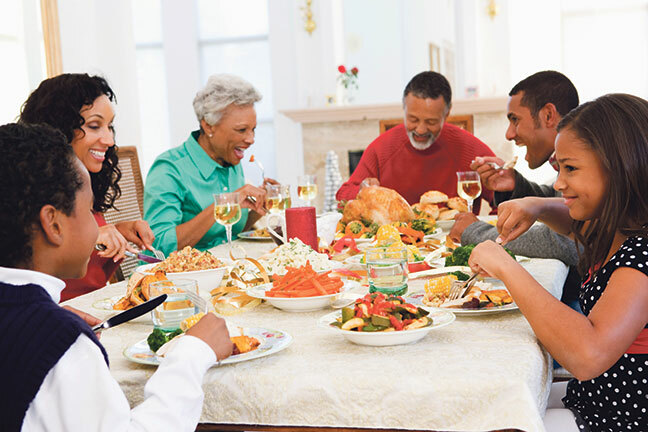 Family outings, gatherings and traditions are a large part of the holiday season for many people. For a stepfamily, the “family” aspect of the holidays can bring added stress and pressure. Children can be adamant about keeping their traditions from first families and dismissive of traditions of their stepsiblings. There can also be stress from outside the household. Friends and extended family may give their two cents. “I would never agree to a holiday meal with his ex-wife. Didn’t you hear she made a snide comment about you recently?” “You’re Jewish, why would you buy Christmas gifts for your new wife’s kids?” Add in adherence to custody agreements and the holidays can be daunting! According to the Pew Research Center, 29 million to 30 million adults in the United States are stepparents. This only accounts for households with children under age 18. Many more have adult stepchildren. If you are one of these millions of adults and harbor a small (or large) amount of trepidation about the holidays, take heart! With a few tips in mind, the holidays can be enjoyable. Plan ahead. The adults should begin talking about the holidays well in advance, and this is especially true in a new stepfamily. Communicate about which parts of your usual traditions mean a lot to you (and your kids) and which ones you are willing to change or give up. Realize there will be changes. Keeping things the same as before a remarriage shuts out the new stepparent and stepchildren. “Blended” may not happen. Step relationships are fundamentally different than first-time family relationships. Respecting those differences can make the holidays run smoother. Allow for some traditions and activities separately. There is nothing wrong with each parent and his or her children visiting certain family members or attending some events separately. Wednesday Martin, author of Stepmonster: A New Look at Why Real Stepmothers Think, Feel and Act the Way We Do, recounts a family who put up two Christmas trees every year, each with its own set of decorations. This solution honored traditions for all family members and also became a tradition in its own right. Play down traditional holidays, play up nontraditional ones. Traditional holidays come loaded with expectations. Differing expectations lead to conflict and stress. Consider giving other dates and events increased importance and fanfare. Perhaps Halloween can become the stepfamily’s new tradition. Special foods, decorations, pumpkin carving and parties can all be planned and looked forward to year after year. Birthdays can be celebrated with lots of gusto and fussing over the birthday boy or girl. Focusing on nontraditional events frees children from loyalty binds they might feel about traditional holidays. They will often embrace the opportunity to celebrate a “new” holiday. Remember the reason for the season. Keeping gatherings simple and inclusive promotes a harmonious environment. All kids, regardless of age, want to feel comfortable and like a family when at their parent’s house. Don’t treat older teen or adult stepchildren like guests. When preparing and serving a meal, give them a job and let them pitch in. Plan activities everyone can participate in, such as watching a movie, baking or making a craft. Shared activities promote relationships and create memories. Resist the urge to create a Norman Rockwell moment. Unrealistic expectations can be a setup for failure. Remember, kids are out of their routines and wound up tight, and adults are often exhausted from shopping, decorating and cooking on top of their usual responsibilities. Kids may cry or bicker with each other and adults may make a short-tempered comment during conversation. That’s what happens in families—all families. Expect moments of disharmony and don’t let it overshadow the entire experience. Patricia Papernow, author of Surviving and Thriving in Stepfamily Relationships, writes, “Becoming a stepfamily is a process, not an event.” Arm yourself with a well-talked-about plan and a relaxed, realistic attitude. Enjoy the season as part of your family’s process.